Raymond Duval was born in Grand-Mere, Quebec, 23 November 1886. 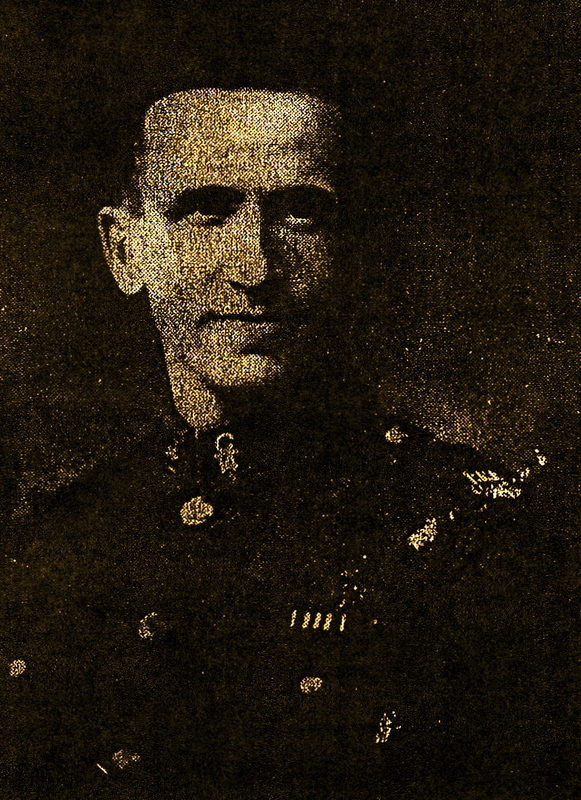 He enlisted with the 244th Infantry Battalion, Canadian Expeditionary Force, on 10 August 1916. Like many battalions of the C.E.F., his battalion was broken up and used as reinforcements for battalions already in the field. Private Duval was assigned to the 23rd Reserve Battalion in England, before joining the 14th Battalion, Royal Montreal Regiment, in France. He served on the Western Front at the Battles of Hill 70, Passchendaele, Arras, Amiens, Canal Du Nord, and Cambrai, until he was discharged on 21 April 1919. The RMR Foundation is working to keep alive the memory of those who served during the First World War and starting from 22 March 2017 we have been publishing the daily diary of an eye-witness from the RMR: Private Raymond Duval, MM. Duval enlisted in the summer of 1916 and eventually reached the front and was officially badged into the Regiment in June 1917. He kept a diary throughout his time in the war which he published it as a memoir in 1954. This project is a result of the efforts of his grandchildren, Catherine and Greg Duval, who endeavoured to have the diary republished after Catherine Duval visited her father (Raymond Duval’s son) in 1997 in the Channel Islands where the Duval family is from originally. It was his wish to see the diary published. In 2008, Catherine contacted Professor Jonathan Vance of Western University who was interested in the project for one of his graduate students. So thanks to the efforts of Catherine and Greg Duval, this diary is available online for all to peruse. In 2014 The Diary and Memoir of Private Raymond Duval was edited and compiled by Natalie A. Dyck, and she has graciously permitted the RMR Foundation to publish Duval’s entries online. Starting with his first entry on 22 March 1917, we will publish each entry online precisely 100 years after he originally wrote them. Lest we forget. It’s a term we’re all familiar with every November 11th, which compels to recall the past sacrifices that make our present possible. But for Private Raymond Duval, it was a prescient belief that drove him to record his experiences in the First World War as they happened. Sensing the significance of his current events one hundred years ago, he left behind a story that’s evocative of an entire era and rouses us to remember and empathize with a generation lost long ago. Like many men of his time, Duval was excited by the romance and magnitude of fighting for King and country in the war that would give birth to the modern world. Born in Grand-Mere, Quebec, on November 23rd, 1886, he enlisted with the 244th Infantry Battalion, Canadian Expeditionary Force, on August 10th, 1916. Like many battalions of the C.E.F., his was broken up and used as reinforcements for those already in the field. Private Duval was assigned to the 23rd Reserve Battalion in England, before joining the 14th Battalion, Royal Montreal Regiment, in France. He served on the Western Front, witnessing the carnage and senseless human sacrifice at the battles of Hill 70, Passchendaele, Arras, Amiens, Canal Du Nord, and Cambrai, until he was discharged on April 21st, 1919. 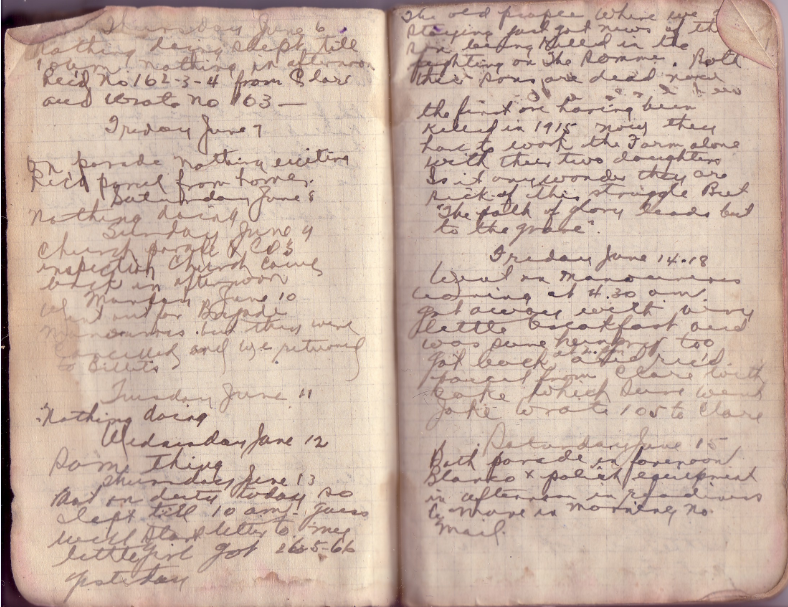 During the war, he maintained a daily record of his experiences in the diary provided to him by the army. After returning to Canada, he was an active member of the Grand-Mere community and the Royal Canadian Legion, and wrote several articles in the local newspaper. With the intention to create a public record of what he called “the brighter side” of combat duty, he again took pen to paper and wrote a memoir in January of 1954. Despite its many horrors, Duval remembered the war fondly, telling his grandchildren that surrounded by the constant and random threat of death, he had never felt more alive. His comrades remained lifetime friends, many of them present for his 60th wedding anniversary to his beloved wife, Clare. Raymond Duval died at the age of 96, in St. Anne’s Veterans Hospital in Quebec. He wished to share his belief that in the worst of times, the human spirit endures, and the best in men can emerge. The writer admits that as in all wars, the first mentioned item is the more impressive, but he also feels that most fighting men (at least those with a sense of humor) can recount many very funny incidents which came to their attention during their stint of combat duty. In most cases, these humorous incidents were forgotten, but as the years went by, many veterans found that some very humorous stories and situations could be recalled. Not all [incidents were] entirely humorous at the time of occurrence, but viewed from the present [and] over the years, the humorous angle has been retained in their memory, with the consequent obliteration of the horror. This natural wish to forget the frightfulness of war is most apparent among veterans of combat. [However], when a few get together and discuss personal experiences with one another, and especially when they feel confident that their companions are men with the necessary experience to appreciate the humorous side of any fighting experiences, [the “brighter side” of the war experience emerges]. With this idea in mind, the writer will tell from his own experience some incidents with which he has had personal contact, or of which he had personal knowledge. I tried to enlist in the Canadian Army on August 10th 1914, but my height [5’2 3/4”] and weight [125lbs.] being very much below the high standard of that day, I was refused with rather facetious comment, which left me, to say the least, very resentful. Having been brought up in a very patriotic British home, by a father who had served in the Jersey (Channel Islands) Militia when very young, it was quite natural that I felt keen disappointment at my “turn down.” However, in the summer of 1916, with the help of a personal friend, an infantry officer, I was, much to my joy, accepted and enrolled in a Montreal Infantry Unit [244th Battalion Royal Montreal Regiment, Canadian Expeditionary Force]. At the time of my enlistment, I was working for a large industrial concern as a foreman, and had under my charge some 20 to 25 laborers. Almost all of them were men of little or no education, and the war seemed very distant and unreal to them. Part of my job became to some extent, the dissemination of the aims and object, etc. of the war, with the idea of getting recruits for Canada’s then Volunteer Army. With the idea of thus fostering patriotism and enlistment, I, like a number of other boys in the plant, [was] asked to stay on the job and wear uniform at work. In going around the plant in uniform, a few companions and I, managed to get some fun out of it: One of the men in my gang was especially dense, with a terrible fear of going to war, especially when conscription was mentioned in any way. I soon got wise to this, and in order to get a laugh from the rest of the boys, I occasionally put this chap through mental torture by questioning him as to his age, family conditions, etc., ostentatiously pretending to record his answers in a note book. I finally had to give up that stunt, as I soon perceived that the man was being driven into a nervous condition. After about a month of the uniform wearing period on the job, we were transported to Montreal [to] join our unit for training. To say the least, [training] was very elementary, consisting of route marches and ordinary parade ground infantry drill, and some easy mild PT [Physical Training]. The amateurish training continued through the late summer and following winter until the Battalion embarked for overseas in late March. The first incident which occurred after being installed in Barracks, was being detailed to scrub the floor in the main entrance lobby, around which were clustered the Head Quarter’s offices. I found this job very embarrassing. After several years as a foreman in charge of a large plant department, to be ordered to do a job similar to one which I had been used to giving to a laborer, was, to say the least, very hard to swallow with anything like equanimity. However, I became quite used to such and worse situations as time went on, without denting my shell of false pride. In the meantime, my fiancé and I decided to get married before embarkation. Our preparations went on apace while having a very happy time, with various amusements (but in and out of barracks), and eventually on the 24th of January, we were married, but not without some trouble. I had obtained permission to be married from my C.O., and everything seemed to be working out fine until the day of the wedding, when to my horror, one of the men in the same room reported sick at noon. It was thought that he had spinal meningitis, which if correct, would mean that the room or perhaps the whole building would be put under quarantine. On my pass, [that] would only allow me to leave barracks at 6:00pm. The wedding having been planned for 7pm, it can be appreciated how worried I was for a few hours. I went to work with my friends to let me down through one of the second story windows if the quarantine order came through. However, this did not occur, and I was able to go at the time set. We were married at the home of my wife’s aunt in the west end of the city, and the ceremony was performed on schedule at 7pm by my wife’s uncle, the Rev. E.M. Taylor of Knowlton, PQ. The wedding furnished a somewhat ludicrous situation when the guests – mostly relatives – discovered that no one had procured any confetti. Someone found a quantity of rolled oats with which they showered us as we left the house on our wedding trip. Please check the RMR website daily for the next two years to read Private Duval’s diary. He maintained his diary from the day he left Montreal until arriving back in Montreal with the Regiment on Easter Sunday, 20 April 1919. Batman: A soldier-servant to a commissioned officer. Blighty: English slang term for Britain; also used to describe wounds serious enough to be sent home. Big Bertha: German super-heavy, long-range howitzer gun, named after Bertha Krupp von Bohlen und Halbach, the wife of the owner of Krupp steel works, which manufactured the gun especially for the First World War. Famous as the guns used to bombard Paris in March and April of 1918. Boche: Anything German. Taken from the French slang “tete de boche,” meaning a stubborn or obstinate person. Bull Ring: Area at base camps where intensive “refresher” training was carried out. The Bull Ring at Etaples was famous for its severe discipline. Bully: Bully beef, tinned corned beef used as a protein ration by the British Army. Colonials: Soldiers of the French Army, usually African, but sometimes also used to describe Canadians, Australians, and New Zealanders. Coy Books: Refers to the Company (Coy) books, payroll, operational, or otherwise. Estaminet: Bar/Café found in villages and towns, and run by civilians for the purposes of eating, drinking, and the general entertainment of off-duty soldiers. Fritz: A nickname for Germans. Funk hole: A small dug-out/shelter for one or two men in the side of a trench. Great Coat: Long wool coats issued to soldiers for cold weather wear. Imperials: British soldiers of the BEF (British Expeditionary Force). I.O.O.F. (International Order of Odd Fellows): An altruistic fraternal organization derived from the English Oddfellows, with lodges throughout North America. Jake: Trench slang meaning fine or alright. Minnie: German minnenwerfer, a type of trench morter. Napooed: Finished, gone away. Corruption of the French “il n’y en a plus” (there is no more). On the boards: The boards at the bottom of the trenches, tents, or huts. Orangeman’s Day: An annual Protestant celebration on July 12th, originating in Ireland. Celebrated by members of the Orange Order or Orange Lodge, a Protestant fraternal organization. Padre: A military chaplain who ministers to members of the military. Paliasse: Straw mattresses issued to soldiers to sleep on. Parapet: The side of the trench closest to the enemy. PH Helmet: Gas masks issued by the British army that consisted of a hood worn over the head and face. Pill-boxes: Structure made of reinforced concrete to enclose a machine gun nest. Pineapples: Nickname given to a type of trench mortar for their resemblance to the fruit. Puttees: Standard part of CEF uniform; long, narrow piece of fabric wrapped around the leg from ankle to knee to provide support and protection. Lorry: Large motor vehicle similar in design to a pick-up truck, used for transport of soldiers and goods. Runner: Responsible for carrying messages to and from one area or commander to another, often through active battlefields. Generally worked in pairs. Strafe: Machine-gunning/bombing by planes. Derived from German verb “strafen,” meaning to punish. Tapes: Used to mark out start line or direction of an attack. Tommy Cooker: A portable, compact, alcohol-fueled stove issued to British troops (“Tommies”). Whiz-bangs: A high-speed shell whose sound arrived almost at the same time it exploded.